We all know what happened to Marcus Lattimore. The star running back was blocking for Bruce Ellington in the fourth-quarter of the Gamecocks’ battle with Mississippi State when a Bulldogs defender rolled into Lattimore’s knee. Every USC fan – and just about every college football fan – anxiously anticipated the devastating nature the injury. Lattimore had torn his ACL. After several weeks of working to decrease swelling and increase motion and strength, Lattimore underwent knee surgery to reconstruct his ACL. Sports fans read about football players returning from ACL surgery all the time. Lattimore’s injury should be fairly straightforward, right? Maybe. It depends on what his injury and surgery really involved. Since that statement, and especially after his surgery on November 17, there has been little mention of any other damage found in Lattimore’s knee. Specifically, as an orthopaedic surgeon, what I would like to know is whether he suffered a meniscus tear that was treated during that procedure. An attempt to interview Marcus through the USC Media Relations office was unsuccessful. As the Heisman Trophy candidate prepares for his return against Vanderbilt on August 30, I am curious for medical reasons. The presence of a meniscus tear could have a profound impact on his football future. Traditional thinking among sports medicine surgeons has maintained that athletes have terrific success returning to sports at the same or higher level after ACL injuries. Those beliefs have been questioned in recent years. In a column I wrote earlier this year, I even cited a study that showed only 70% of college football players returned to play. Running backs have been shown to have particularly tough recoveries. A 2006 study in the American Journal of Sports Medicine looked at return to play for NFL running backs and wide receivers. More than 20% of those skill players never returned to play after ACL surgery. A power rating analysis of those players showed that performance dropped by one third if they did return. The meniscus (yellow arrow) is a C-shaped shock-absorbing structure in the knee. 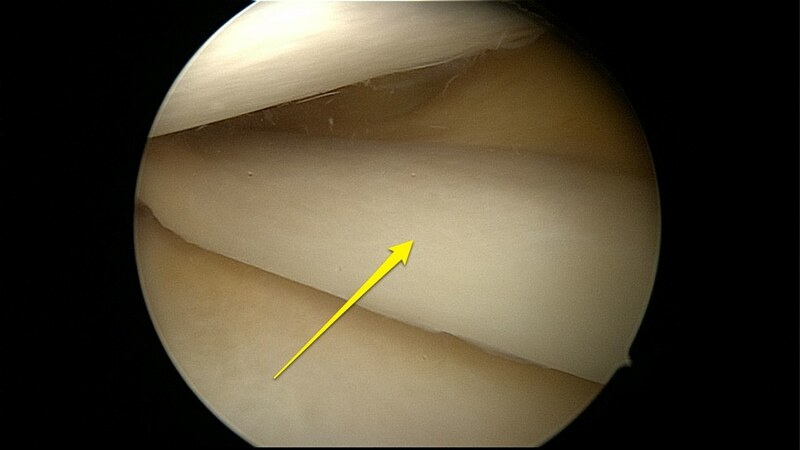 The meniscus is intact in this arthroscopic image. A meniscus tear could have an even more detrimental effect. The meniscus is a C-shaped piece of cartilage that serves as a shock absorber in the knee. It has been estimated that meniscus tears are found during 40 to 80% of ACL reconstructions. The problem for athletes with meniscus tears lies in the loss of some of their shock-absorbing properties. If the player has part of the meniscus trimmed out (a partial meniscectomy), then the repetitive stress of running, cutting, and pivoting places more stress on the bones and cartilage lining of the knee. That stress could cause degenerative changes over time. 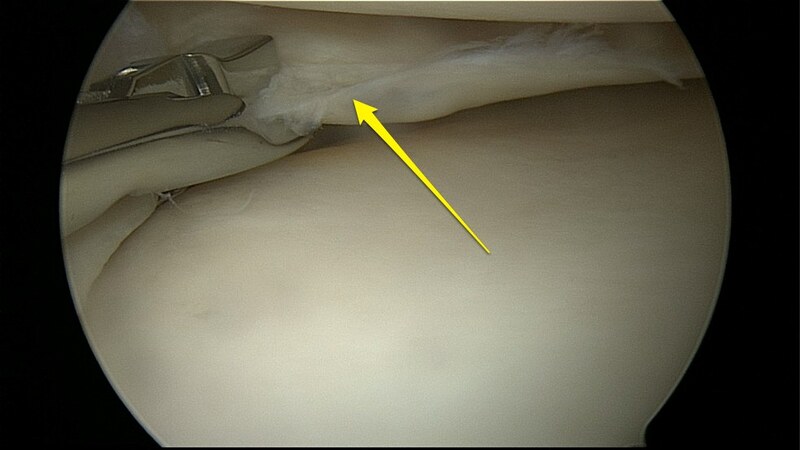 The surgeon trims out the inner, torn part of the meniscus (yellow arrow). The combination of an ACL and meniscus tear could have an adverse effect on a running back’s career. Last year, Robert Brophy, MD and other researchers showed that NFL players who had undergone ACL reconstruction and partial meniscectomy had shorter careers in terms of future games and years played than those who underwent either meniscectomy or ACL reconstruction alone. I certainly understand if USC wants to protect Lattimore’s privacy and medical information. As the Ray Glier article in the New York Times pointed out, NFL teams will eventually learn the extent of his injury. The team doctors of all the teams potentially interested in drafting him will examine his knee thoroughly at the NFL Combine. They will test his ACL and meniscus, review the latest MRIs, and inspect operative records. NFL teams understand the effects of these injuries and calculate risks accordingly. Clearly it doesn’t sound like a fear of reinjury will keep them off the field. I just hope structural damage in his knee doesn’t hinder him – this year or for many years to come. Note: The following post appears as my sports medicine column in the August 30, 2012 issue of The Post and Courier.